This is the story behind DSP Anime, or how Tsugi found itself providing procedural audio technology to thousands of unsuspecting game developers in Japan and around the world! When Tsugi’s founder Nicolas Fournel arrived in Niigata, Japan in 2011 after positions at Factor 5, Konami, Electronic Arts and Sony, he brought with him his passion for game audio, procedural techniques and artificial intelligence. Nicolas was also keen on simplifying the workflow of sound designers and developing tools that would offer a better user experience. Although the cornerstone of Tsugi’s business was R&D consulting, reaching directly to sound designers with innovative tools was very tempting. Due to the team’s experience in that domain, it was decided to start with a tool allowing for the easy generation of game sound effects. But what type of sound effects? In addition to its amazing food, Niigata is also famous for its manga and anime artists. This was a perfect match! The team would develop a sound generator for typical Anime sounds. It was innovative, would allow for a very graphic user interface and would be fun and enjoyable, both to work on and to use. It would be relatively low-priced and would democratize procedural audio. Project “Mango” was born (at the time, Tsugi used exotic fruits for the codenames of its prototypes). Shintaro Takemoto was incontestably the man for the job. Tsugi’s new lead graphic designer came with a very unusual background. He learned biochemistry at the university of Nagaoka before working in a Sake brewery, doing web development while creating indie horror games that have a devoted following. But more importantly, he also drew a couple of mangas published by the city of Niigata and had a perfect drawing style for this project. Quickly, the now famous workflow of the DSP series came together. You would select a category, a type of sound, adjust a few meaningful parameters and play the sound: no sound synthesis jargon or game development gibberish involved! You would also be able to randomize the sound to create near infinite variations. 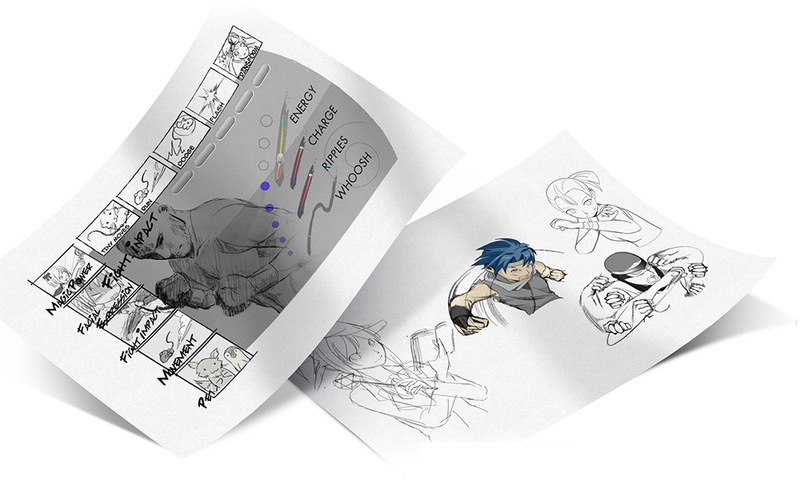 Initial sound categories such as magic, fight, events, whooshes and emotions were selected. While Takemoto-san was busy designing colorful characters for these categories on his graphic tablet, a basic synthesizer called tsugiSynth (shown below) was being conceived. 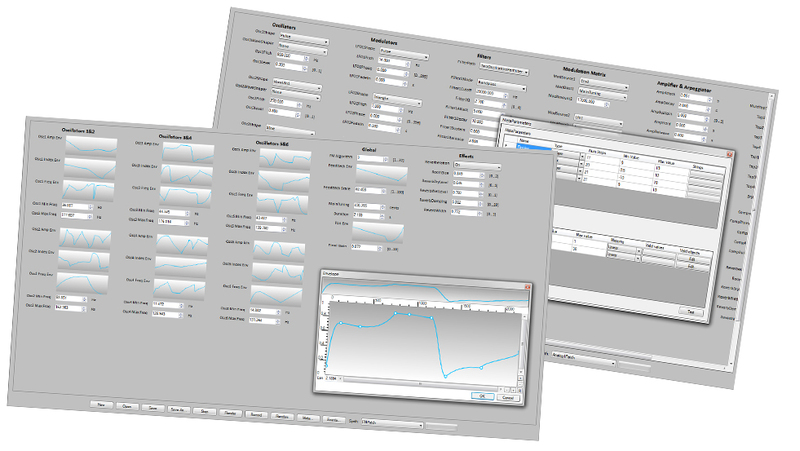 It supported plug-ins, each of them representing different synthesis models and providing a simple editor. This was necessary, as it was decided early on that not only the tool should be affordable, but that Tsugi would provide free extensions to the users. Although project Mango ultimately generated wave files, everything was actually calculated in real-time with sample accuracy and some of the algorithms were an inspiration for the models in GameSynth, the brand new multi-platform procedural audio middleware from Tsugi. While the audio DSP was being programmed by Nicolas Fournel in tsugiSynth, Masahiro Yoneyama handled all the GUI work, and there was a lot! The interface of DSP Anime uses funny shapes, transparencies, onomatopoeia animations and more! Yoneyama-san was freshly hired from the NCC (Niigata Computer College) that forms game developers just down the street from the Tsugi office. NCC is famous nationwide and is always present at the Tokyo Game Show. These days, Yoneyama-san is the main GUI programmer behind tools such as Alto Studio and GameSynth. Soon, sound designer Axel Speller was flown from France to participate to the overall design work, create amazing sound patches in tsugiSynth and later do the QA of the software, thanks to his incredible attention to detail. By that time, there were 3 official working languages at Tsugi: Japanese, English and French! Natsumi Morita, a graduate from the local Niigata manga college JAM also joined the Mango team and helped immensely with cleaning graphic assets and organizing them. Finally, Akiko Uchida completed the team, making the bridge between the English and Japanese versions, refining the Japanese parameter names and onomatopoeias that would be animated when playing the sounds, and translating the user manual. To our surprise, the press release was picked up by several major sites in Japan and then hit the web by storm. 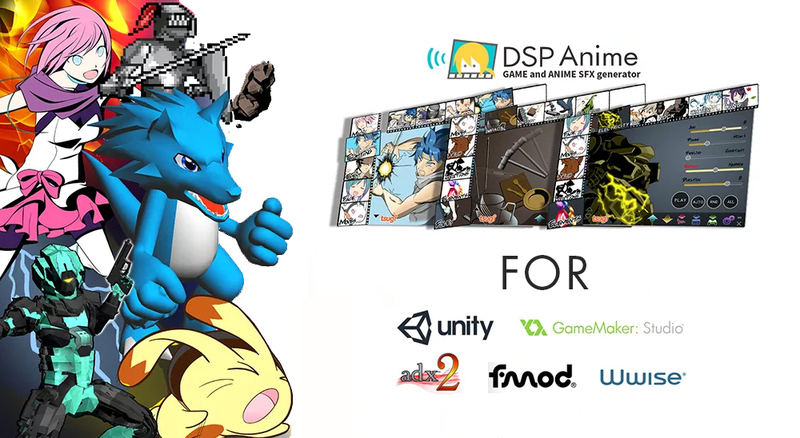 The rest is history as they say… To this day, DSP Anime is still widely acclaimed among indie game developers in Japan and many people started using it outside of game development, from local TV channels and radio stations, theater troupes and web site designers to 3D movies and, of course, Anime studios! A few months later, the same team released DSP Retro which recreates the iconic sound effects of the older generations of game consoles and was also very successful. Since then, many extensions have also been published such as “Pets”, “Locations”, “Elements” and “Foley” for DSP Anime, which makes it an all-purpose sound effects generator for games and media. 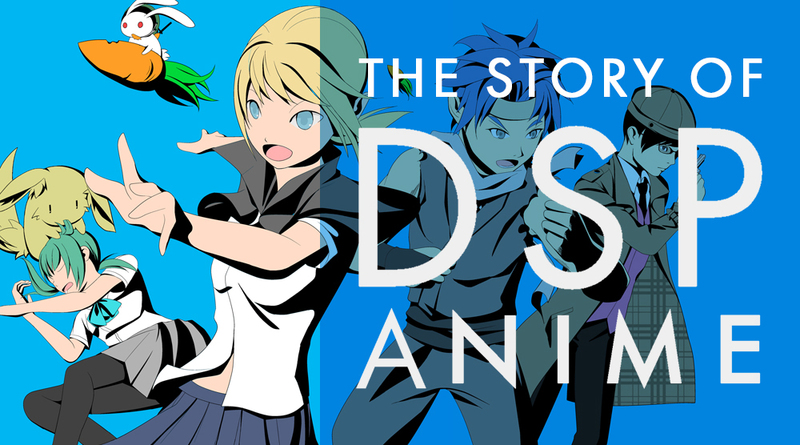 DSP Anime was a very fun project to work on and we hope you will have as much pleasure using it than we had creating it! You can visit the DSP Anime page for more information.